This video is a speech from Barrick Gold's founder and chairman, Peter Munk, at the company's shareholder's meeting last year. The only thing that we added were the photos from Barrick's operations around the world, to expose the delusional and misleading nature of Munk's words. The photos in this slide show were provided by the communities impacted by Barrick's operations and journalists who have visited Barrick-impacted areas. If you would like to know more information about any of these photos, contact protestbarrick@gmail.com or visit protestbarrick.net. The following is a summary of some of the images and their source. 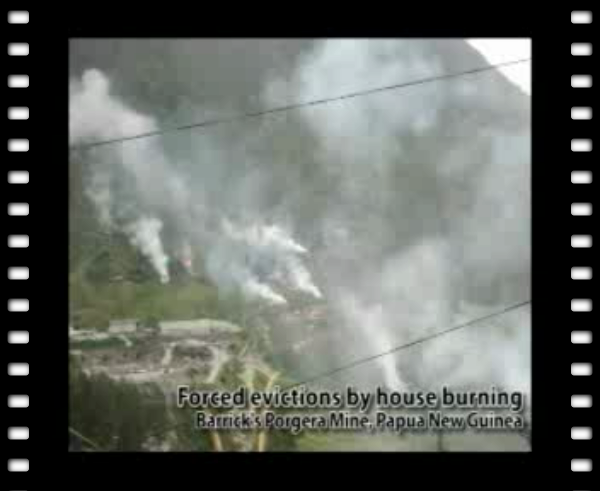 Papua New Guinea: Several photos from this video come from Barrick's Porgera mine in PNG, where several villages rest on a man-made island literally surrounded by an open pit gold mine and its expanding waste dumps. Villagers are seeking resettlement away from the mine site, where mine waste is dumped directly into the river system and mine security have been accused of shooting and killing locals for "trespassing." In 2009, the Norwegian Pension Fund divested $200 million from Barrick Gold due to the riverine tailings disposal in PNG. Tanzania: In addition to regular confrontations between mine security and locals, often ending in death, Barrick's North Mara mine in Tanzania has had life-threatening pollution to which Barrick has responded with cover-ups and lies. There have been two reports confirming lasting negative effects of a toxic spill in Tanzania that occurred last May. The latest report, commissioned by an interfaith committee in Tanzania and written by scientists from Norwegian University if Life Sciences and the University of Dar es Salam, found potential life threatening levels of arsenic around Barrick’s North Mara mine in Tanzania. The study investigated the area around the tailing dam and the site of an accidental spill that occurred on May 9, 2009. Despite that fact that these areas were tested four to seven months after the spill, this study shows that the water remains toxic for human consumption and grazing use. According to Evans Rubara of the Christian Council of Tanzania, "Following the spill in May, 203 people became ill, 43 people died, and 1358 livestock died according to the Ward authorities in North Mara.” The photos featured of the Barrick responded to the report criticizing the integrity of the science, to which the authors responded with a detailed defense of their methodology. The photos of the people with skin diseases in North Mara (a child and a woman) were taken after the 2009 toxic spill. According to Chacha O' Wambura of Fundation HELP, the NGO that circulated the photos, "according to those people [in the photos], their neighbors, relatives and their local leaders the rashes developed after using the water." Other photos from Tanzania include shots from Barrick's Bulyanhulu Mine in northern Tanzania. When that mine was operated by Kahama Mining Corporation, it was the scene of one of the world's most infamous cases of mine-related violence. In August 1996, it is alleged that over fifty artisanal (small-scale) miners were buried alive in a pit by a bulldozer used to construct the mine (photos of the exhumed bodies are in the slide show). The move was seen as a tactic to clear the pits of an estimated 250,000 artisanal miners in the community. The mine was then sold to Barrick Gold in 1999. Philippines: These photos (as well as many of the photos from Tanzania) were taken by Canada-based Photojournalist Allan Lissner, as part of his "Someone Else's Treasure" Series. The San Antonio Pit contains millions of tons of mine waste being held back by failing dams. According to a leaked document from Placer Dome's own environmental consultants, "failure of the dam is a virtual certainty in the near term". When the Philippine government ordered Placer Dome to make the necessary repairs, and clean up the mess from two previous dam failures or face criminal charges, Placer Dome responded by pulling out personnel from the Philippines without a word to anyone. * note: Barrick does not mine or have plans to mine in Mindoro, Philippines. These photos, also taken by Allan Lissner, are meant to demonstrate the absurdity of Munk's words, that there is no alternative to mining "development". Stop Mining on Native Land! While Peter Munk boasts that the presidents of several countries have begged him for his foreign investment, the clear message "Stop Mining on Native Land" forms a backdrop to expose the underhandedness of his statement. Following that image, news articles are flashed on the screen of native struggles against Barrick Gold and the Nation states working in collusion with the mining giant. These struggles include the Western Shoshone legal battles against both Barrick and the Bureau of Land Management in the United States, the struggle of the Baloch People for control of Barrick's Reko Diq project in Pakistan, the struggle of the Wiradjuri People for the protection of their Sacred Heartland in Lake Cowal, Australia, and of course the struggle of the Diaguita Huascoaltinos against the Chilean State and Barrick's Pascua Lama project. The Pascua Lama project is also plagued by a lawsuit by the Diaguita Huascoaltinos Indigenous community against the Chilean state, recently admitted by the Inter-American Commission on Human Rights. Their claim states that the government not only violated the Diaguita's Free, Prior, and Informed Consent (FPIC), but they also did not consider comments submitted by their community in the Environmental Assessment Process of the Mine. The claim also states that Barrick's claim to land on and near the Pascua Lama project on the border of Chile and Argentina relies on a series of fraudulent land claims to collectively held-Diaguita Huascoaltinos land. The Diaguita Huascoaltinos also initiated two lawsuits against Barrick in Chile, seeking to slow down and stop Barrick's mining and exploration on their land. Manipulation of land title can also be observed in Barrick's Lake Cowal mine in New South Wales, Australia, where Barrick's manipulation of Native Title has led to the desecration of a Wiradjuri Sacred site and important wetland. Since the Lake Cowal mine – which is licensed to use over 12 million liters/day of water – has been in operation, the area has experienced two water "crises," the latest one in October corresponding with lowest levels at the Wyangala Dam on the Lachlan River since 1970. These same issues can be seen in the United States, where Barrick wants to expand its mining operations in Nevada. The state’s Western Shoshone tribes claim the U.S. Bureau of Land Management didn’t fully evaluate the environmental impact of the mine expansion before approving it, and have brought a suit against the company. While initially denied, the Shoshone won an injunction on appeal in a San Francisco Federal Appeals Court. However, Barrick later appealed again to win a limited injunction so the mine didn't have to shut down while the BLM conducts the studies. At that mine, the gold is found underneath the water table, and the Shoshone argue that pumping water out of the pit would cause the groundwater level to drop and potentially dry up more than a dozen streams and springs that the Shoshone hold as sacred. In Balochistan, Chief Minister Nawab Aslam Raisani announced January 5 the termination of a mining contract for Barrick Gold's Reko Diq project, following a unanimous decision by the Pakistani province’s cabinet. According to the Minister, "They (Barrick and Chile’s Antofagasta, co-owners of the mine project) only have an exploration license, which does not cover extraction," adding that his government would not allow any agreement which undermined people's rights. Immediately, US ambassador to Pakistan Anne Patterson made a statement warning that "multinational corporations will not invest in a country where deals are canceled." Canada’s international trade ministry followed suit, pressing Pakistani officials to “fulfill their obligations under a 2006 Pakistani-Canadian-Chilean agreement potentially worth billions of dollars,” according to the Vancouver Sun. Balochistan, the province in Pakistan bordering Iran and Afghanistan, has been struggling for its independence from Pakistan since 1948. More than 8,000 Baloch have been disappeared since 2004, and 26* prominent leaders have been assassinated.